RecruitBPM is a cost-effective cloud-based talent acquisition and end-to-end recruitment management platform that helps companies optimize their hiring process. Designed for small to mid-sized staffing and recruiting firms, it can accommodate 1-1000+ users. 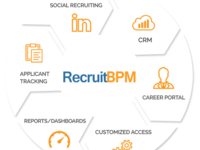 RecruitBPM as a customizable recruiting platform offers various features but the most prominent ones are Applicant Tracking System (ATS), Social Recruiting and Job Publishing, Semantic Search and Recruiting Analytics and Reports. Pros: Our company has tried several other tools for hiring purpose in past that were highly expensive offering basic features and few integrations. Another disadvantage was costly ongoing upgrades. On the contrary, RecruitBPM is a cloud-based recruiting solution that is very affordable with valuable features, integrations that are continuously improving. It allows us to publish job orders directly on the company's career page, many job boards and on social media channels such as LinkedIn, Facebook and Twitter. Most useful attributes for me are suggested candidates against a job order and email notifications that keep me notified about potential candidates for the open jobs. Cons: I really like to have live video interview ability in this software to let us screen the candidates more easily. Besides, whenever I got stuck in handling the application, I found customer care very helpful. Pros: Highly functional applicant tracking software with a lot of capabilities, integrations and features. I feel very comfortable to use this tool as it gives complete freedom to customize not only work flows but also allows to add custom fields in any module of the application. Search functionality provides thorough probing of data and most relevant results which saves my time and let me submit better suited applicants. Additionally, reporting capability of this tool allows to monitor recruiting data for performance and goal rate analysis. You can also track email engagement with candidates through activity log and know about which time is better to have a conversation with them. All these aspects help me immensely to achieve my goals and plan for my future projects. Cons: Although there are no significant complaints about RecruitBPM. But still want reporting to be more customizable so we can add more metrics to measure the overall recruiting process needs. Pros: RecruitBPM applicant tracking is one of the best tools in the market. It's not only valuable to make recruiting tasks easier but also let us automate recruiting in very low budget. The tool has a great way to organize, manage and track candidates from the job applications to the placement phase. Most handy aspect of this tool is being user-friendly. Another value adding feature is integrations with social media and job boards which makes searching, referring and driving candidates to our recruiting platform. Overall: All in all it's a wonderful experience of getting the whole hiring process simplified in such a little cost. Pros: RecruitBPM helped us to organize the recruitment process and get tasks done in a stress-free manner. It has significantly improved the success rate of our recruitment efforts since last 3 years. Seamless integration of multiple job boards with this application enable us to send job posting to several free job boards with few clicks, save hours of manual job posting on each website. We can source candidates from multiple resources, track the potential candidates, screen applicants and complete smooth on-boarding through a single platform. This tool increased communication level among our managers and recruiters which reduced the hiring time-frame and enhanced team performance. Cons: It seems that RecruitBPM team is constantly improving the system and adding more advanced features. The issues I faced a few weeks back are resolved and I can't find anything problematic right now. 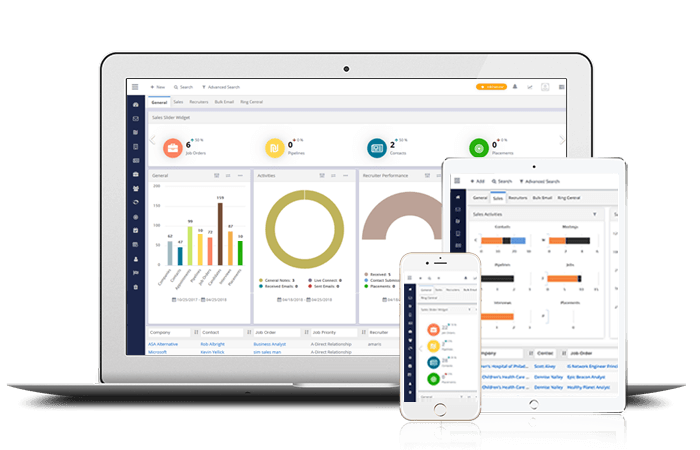 Pros: One of the best things I like about RecruitBPM are the integrations it has with RingCentral for calls and SMS tracking, email and campaigns' tracking with Mailgun. These integrations save a lot of our time whether it's to call a candidate or to send emails in bulk. Moreover, the storm search feature of this product let us find the most suitable candidates for particular job positions in less time. Cons: I would like this recruiting software to add multiple e-Signatures integrations. Overall: RecruitBPM is highly efficient recruiting solution and has been facilitating us to be done with most of our important and time-consuming recruiting tasks quickly. It also allows us to automate the hiring process. The tools and features in this applicant tracking software are very useful and facilitating. Pros: This tool has helped us bring our whole team to a common platform to collaborate while hiring and stay updated regarding whole process. Now we can maintain team performance metrics, overall recruiting reports and candidate engagement to analyze the overall progress of the company. Customization of application allows to add and edit custom fields in all modules. You can change candidate statuses, applicant tracking workflow, add more fields to job orders etc. to fulfill recruitment needs. Intuitive layout and simple navigation for new users. Cons: I have no complaints about RecruitBPM as they are constantly updating their software and making improvements by adding more features. Pros: This amazing tool provides complete hiring solution that allows us to do candidate sourcing, tracking, screening and background checking without any fuss. Now we can contact large number of candidates through multiple sourcing platforms. Bulk email features also save a lot of our time and also let us track the communication with ease. Candidate hot list is another best incentive through which we can create our own preferred lists and use them with just a click while staying within the application. Cons: Occasionally it slows down whenever we process a large number of records. I would also suggest to have a feature of internal chat or discussion that allow our team to collaborate. Pros: RecruitBPM proved to be effective for speedy communication with applicants and speedy completing of job orders. The insights it provides through analytics helped us to tailor our recruitment strategies for potential clients. In general, simple and customizable layout, smooth navigation, integration with email services and job boards, diverse search feature and event management are the few most admirable aspects of this ATS. Cons: In my opinion, the reports can be more useful if they are customizable for more in-depth analysis and tracking of activities. Overall: I would recommend this tool to recruiters and hiring agencies who are looking for smart yet low-priced hiring solution to achieve better fill rate in less time. 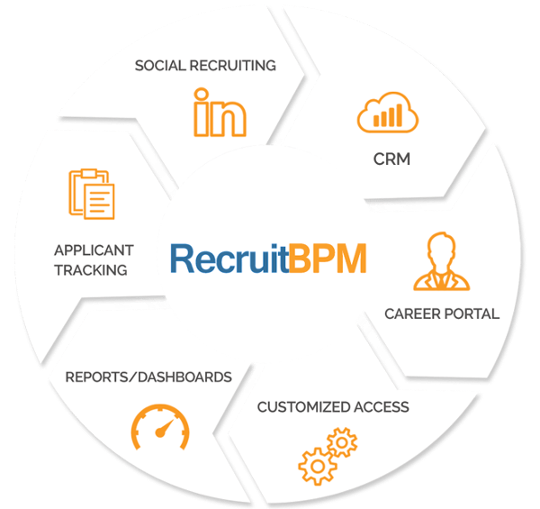 Pros: We use RecruitBPM applicant tracking software to manage candidates, clients and also internal hiring teams. An easily customizable work-flow paradigm that simplifies and automates your work. You can also be able to customize career portal for employer branding, utilize integrated social media to source candidates and advertise jobs, track all the hiring cycle from a centralized position and communicate with contacts as well as candidates quickly using email templates. It also helps you to stay on top of every step and track analytics to improve sales. Cons: I think they should enhance their help guides to let us get familiar with each functionality in the system more quickly and utilize them accurately. Overall: I would recommend this application to other companies like us as its constantly improving, reliable and less expensive in terms of cost and training. Comments: When it comes to managing our day to day recruiting activities, RecruitBPM has been very convenient to deal with them. It has been very functional in letting us keep all the recruiting data in one place, very easy to set up and great at tracking all of the hiring stages. Pros: The main purpose that we have been using this product is to source for potential candidates, publish job-openings, interview scheduling, interaction with the applicants, getting recruiting reports and analytics, and resume storage etc. RecruitBPM is highly customizable as it allowed us modifying the application questionnaire as per our hiring process needs. Cons: All things considered, RecruitBPM is a highly affordable recruiting solution, nothing in it that we dislike. Pros: This applicant tracking system has dozens of major free and premium job boards' integrations like ZipRecruiter, Indeed and Glassdoor etc., which let us easily post our job positions on these job sites through RecruitBPM's platform. It has a user-friendly and intuitive interface with an analytical view which makes you understand the achievables. Cons: We would prefer to have more product Integrations. Overall: RecruitBPM should be the first choice for the small and mid-sized businesses who want to have increased efficiency with curtailed costs. It's one of the highly affordable recruiting software in the market I've ever used, yet it offers competent features like advanced candidate search, integrations, and tools to automate recruiting data. Pros: Strong functionality, very responsive, helpful, and knowledgeable support team. The leadership team is focused on constant improvement and maintaining great value for the cost. The product is highly customizable and support team has helped us to implement the system that it works almost exactly to our needs. Love it! Cons: RecruitBPM is one of the best applicant tracking systems in the market with nothing to regret about. 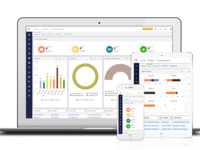 Overall: It's a well-designed applicant tracking system with standard interface functionality, yet, the best part is that it is also very customizable. Along with that, the support team is very quick to respond particularly to the requests to make things work in ways specified to our company's requirements. Pros: In my role as a finance specialist at our company, I am responsible for keeping a detailed check on the payroll system. RecruitBPM let me have detailed insights into the type of contract as well as the duration of the contract. I am responsible for managing the billing system and logging time of the consultants as well. Cons: There are no downsides of using RecruitBPM so far, it is overall very effective and let the members of a team to quickly and easily access information anytime anywhere. However Quickbooks integration will be a plus. Overall: I have been using RecruitBPM for more than two years and am overall very pleased with the features and functionality of this software. Pros: RecruitBPM is not only for recruiters to process the hiring tasks seamlessly, but it also provides huge support to increase sales. We can access all the data regarding latest and previous deals from a central point. Our team can interact with multiple contacts using bulk email option which allow us to stay in touch with our current and potential clients. All the communication and correspondence are also tracked by the ATS and we can view it from the email tracking section in Company detail page. Marketing campaigns can also be handled while staying within RecruitBPM as it also offers Mailchimp integration. Overall: Customer support is best as they give quick response and try to resolve issues instantly. Pros: We're small to mid level staffing firm using Recruitbpm for our daily recruiting needs. Recruitbpm is continuously improving on performance and adding new features like any other expensive recruiting software but this is easy on pocket. I love it's storm search, very quickly finds skills from candidate's resume and video Interview is an amazing feature which I never expected in low budget product. RecruitBPM's Storm Search is just amazing! Pros: RecruitBPM with its keyword-based storm search feature has made it really easy for us to search the most suitable candidates for a job position. It also efficiently parses in the candidates' detail into our company's database. With this recruiting software we are able to keep a record of necessary information like candidate notes and communication history, consequently, we can use it for future reference and screen the best candidates. Cons: An employee referral program will be a great addition to RecruitBPM! Overall: It is a very simple and highly customizable applicant tracking system. It has provided our company with many customization options according to our recruiting needs. We are also able to follow the candidates through every phase of the hiring. Pros: Simple navigation, uncomplicated and easy to post and update jobs, customizable, customer support is easily reachable and very knowledgeable. Cons: Since it is a cloud-based product, the recruiting data is accessible anytime, anywhere. It is a product worth the investment. Overall: During my experience in the HR industry, I had been using many recruiting and staffing software but none of them compares to RecruitBPM. This recruitment software is very user-friendly and can be as trouble-free and customizable as you'd like to fit your business needs. It is cloud-based so you can access it from anywhere. RecruitBPM is innovative, mobile friendly and social media integrated. Pros: I like the user-friendliness for candidates and users equally. Social media integration, hiring team collaboration, and customizable applications increase the candidate experience. Job postings are simple and automatically push out to multiple job boards. Cons: RecruitBPM is very handy to use and comes with no disadvantages for the users. It is the best anyone can get. Overall: The number of received applicants has increased exponentially. The candidate experience has been enhanced greatly due to social integration and mobile friendly use. RecruitBPM -- powerful CRM for staffing firms! Comments: The ease of use and deep functionality make RecruitBPM a very attractive option! I have a recruiting and staffing company and I can use RecruitBPM for everything. It's great!! Cons: Better Mobile Application View for RecruitBPM App required. Expecting the updates on this front as soon as possible. Comments: So we started out looking for the most affordable option (not necessarily the cheapest, but best value) and we came across a few that were offering free trials, or cheap standard editions, etc., but none of the platforms we tried out could do as much as RecruitBPM for the price. If you're looking for a Salesforce replacement, this isn't it -- BUT if you're a small-medium company like we are, there's really nothing I've seen that combines quality and value. We had trouble at first with the customer service being shaky, but I attribute that to them being a newer product with few employees. We haven't had any issues in the last few months with our customer service inquiries being resolved. All in all, if you're a small to medium company (especially a staffing or consulting firm), there really isn't too much competition out there for the price. Comments: rBPM is easy to manipulate and it allows me to manage my daily goals.